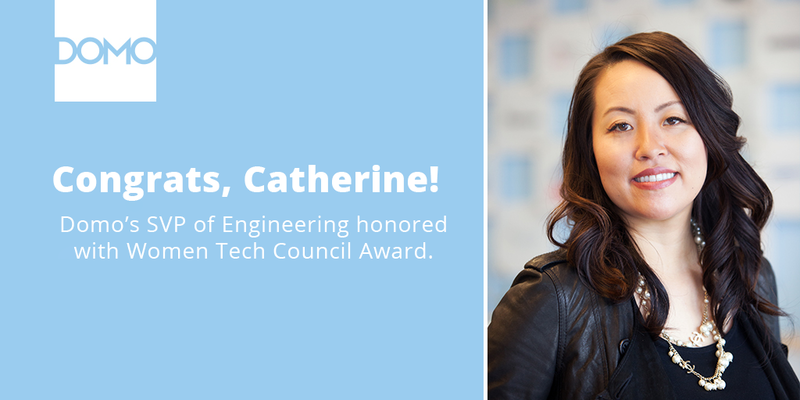 SILICON SLOPES, Utah –September 22, 2015– Catherine Wong, senior vice president of engineering at Domo, has been honored with the prestigious Technology Leadership Award from the Women Tech Council (WTC). The award was presented today at WTC’s Women Tech Awards, an annual event recognizing top Utah professionals who are driving innovation, building companies and making key contributions to Utah’s technology community. Wong was recognized for her accomplishments as a technologist and engineering leader who has helped build Utah’s most high-profile SaaS companies –Omniture/Adobe and Domo. At Domo, she drives the development of the world’s first business management platform – technology designed to change the way business is run. Wong joined Domo from Adobe and Omniture, where she started 15 years ago as a software engineer. During her tenure, she ascended through the ranks, taking on increased and varied responsibility with key roles in product management, product integration, technical architecture and engineering management. She has demonstrated tremendous leadership capability and has been awarded patents in data segmentation, data visualization and SaaS data collection. This is the third year that WTC has awarded Domo leadership. In 2012, Josh James, Domo founder and CEO, received WTC’s first-ever Impact Award for his long-standing contributions to Utah’s tech community. He was the first-ever male recipient of a WTC award. That same year, Heather Zynczak, Domo CMO, was honored with the Professional Leadership Award for her role in helping build one of Utah’s fastest growing companies and her leadership in mentoring. In 2013, Cathy Donahoe, Domo VP of Human Resources, was recognized with WTC’s Human Capital Leadership Award for her outstanding contributions in building Utah’s tech workforce. For more information about Women Tech Council, visit www.womentechcouncil.org.